MG Motor India announced to launch its new SUV Hector in India next month. Touted as the company’s first internet car, it will feature an advanced connectivity system called iSMART. The new MG Hector will be placed in the same midsize SUV segment as the Tata Harrier, Jeep Compass and Hyundai Creta. Prices for the MG Hector are expected to start at Rs 14 lakh. The upcoming MG Hector will come with a next-generation connectivity system which combines hardware, software, services and application. The command console of the car is a 10.4-inch full-HD infotainment touch-screen display that comes with pre-installed entertainment content. 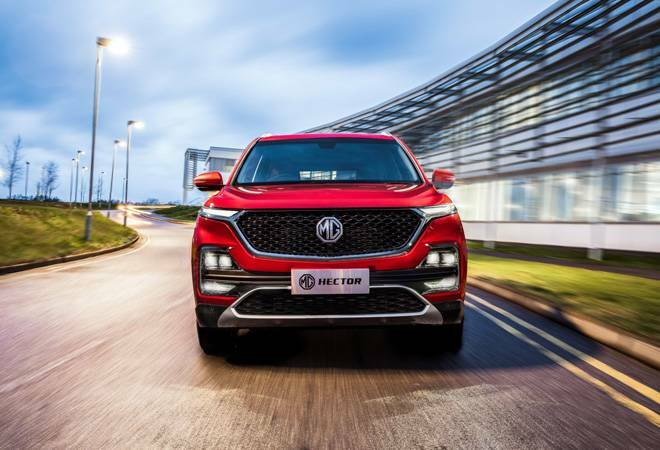 MG Motors states that the Hector SUV will help the owner of the car to stay connected to the internet services with the help of an embedded eSIM. The MG Hector will support Internet Protocol Version 6 (IPV6) and is also 5G ready. The British carmaker has partnered with Airtel to offer free data for the first few years to the owners of the upcoming SUV Hector. This will be the first car in the segment to be launched with an eSIM feature. The SUV’s connectivity system has been developed in collaboration with tech giants like Cisco, Microsoft, and others. MG Motor, for the first time in India, has also introduced over-the-air (OTA) updates to make sure that MG cars get updated with the new updates similar to tablets and smartphones. Additionally, the system would also receive new themes, infotainment content, latest map updates, and more. Apart from these features, MG Hector will also get sensors like tyre pressure monitoring system, climate control, mood lighting, traffic updates, weather updates, 360-degree camera, and 16GB of internal memory. The car’s infotainment system will also support Apple CarPlay and Android Auto connectivity. The Hector will be powered by a Fiat-sourced 2.0-litre Multijet diesel engine, same as in Jeep Compass and Tata Harrier. On the other hand, the petrol engine option will be a turbocharged 1.5-litre unit. While the diesel engine variant will get a manual 6-speed transmission, the petrol motor will be available with an added option of a dual-clutch transmission.